Vitamin E oil and aloe vera are commonly used by alternative health proponents to treat and prevent a variety of skin ailments, such as psoriasis and shingles. Although scientific evidence is conflicting regarding the value of these compounds, preliminary findings suggest vitamin E oil and aloe vera are good for several conditions. Aloe vera has a rich history in folk medicine, as it has been used for medicinal purposes for thousands of years. The traditional uses of aloe include treating constipation, skin irritations, burns and superficial wounds. Modern science has debunked many folk medicine claims; however, research suggests the active compounds in aloe do provide medicinal benefits when used topically. The primary constituents of aloe are compounds known as polysaccharides and glycoproteins. The University of Maryland Medical Center says polysaccharides are capable of skin cell repair and growth, while glycoproteins reduce inflammation and expedite the healing process by supporting the immune system. Vitamin E is classified as a fat-soluble vitamin, which may be found in a variety of dietary sources. More noteably, vitamin E is an antioxidant, which is used by your body to inhibit the formation of free radicals. Free radicals are unbalanced molecules known to damage DNA and cause many ailments, such as heart disease, cancer and premature aging. Vitamin E is also responsible for supporting the creation of red blood cells and for assisting the use of vitamin K by your body. The September 2000 issue of the "British Journal of General Practice" reports that the topical application of aloe vera healed wounds 72 hours faster than in those not given polyethylene oxide gel with aloe vera. The University of Maryland Medical Center states that preliminary research has found aloe vera is just as effective at treating genital herpes and psoriasis as 1 percent hydrocortisone cream. 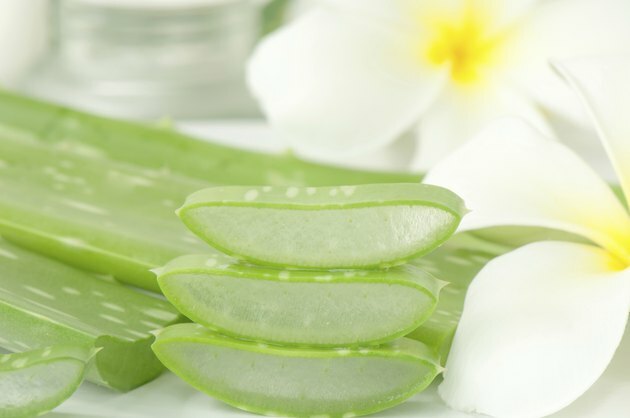 While further research is required to determine the full value of aloe vera on various skin ailments, preliminary findings are promising. The June 2003 issue of the "Journal of the American Academy of Dermatology" cites a multi-institution study where researchers from four universities and research laboratories found the topical application of vitamin E and vitamin C significantly protected pig skin from sunburn. This suggests the topical application of vitamin E oil and vitamin C can protect your skin from photoaging and skin cancer. However, the use of vitamin E alone did not show significant protection. Proponents of vitamin E oil claim this vitamin reduces the formation or appearance of scars and other skin malformations. A study published in the December 2001 issue of the "Dermatologic Surgery" journal found the topical application of vitamin E oil had no effect or actually worsened the appearance of post-surgery scars in 90 percent of participants. Furthermore, 33 percent of participants developed dermatitis, or a skin rash, after using topical vitamin E.
While vitamin E oil may help to reduce yellow nail syndrome, as found in a study published in the "Archives of Dermatology" journal, vitamin E oil does not seem to be good for decreasing scars or other skin malformations.